Chetan Bhagat is the author of eight blockbuster books. These include six novels—Five Point Someone (2004), One Night @ the Call Center (2005), The 3 Mistakes of My Life (2008), 2 States (2009), Revolution 2020 (2011), Half Girlfriend (2014)—and the non-fiction titles, What Young India Wants (2012) and Making India Awesome (2015). Chetan’s books have remained bestsellers since their release. Several of his novels have been adapted into successful Bollywood films. The New York Times called him the ‘the biggest-selling English language novelist in India’s history’. TIME magazine named him amongst the ‘100 most influential people in the world’ and Fast Company, USA, listed him as one of the world’s ‘100 most creative people in business’. Chetan writes columns for leading English and Hindi newspapers, focusing on youth and national development issues. He is also a motivational speaker and screenplay writer. He lives in Mumbai with his wife, Anusha, an ex-classmate from IIM-A, and his twin boys, Shyam and Ishaan. Radhika Mishra is One Indian girl who is intelligent and smart. She works for Goldman Sacks in a foreign land and earns a lot of money. She has had two boyfriends – a creative Bengali boy (Debashish Sen) and a married boss (Neel Gupta) who is two decades older. But Radhika is not lucky in love. She breaks up with both of them for almost similar reasons (don’t ask me what it is because it could be a spoiler). She finally gives in for family pressure and settles for arranged marriage with Brijesh Gulati. He is a geek too, working abroad, earning a lot of money, quite progressive and in fact a kind of man every (today’s) woman might want! And, One Indian girl is about whether Radhika becomes as success and lucky in love as she is at work! 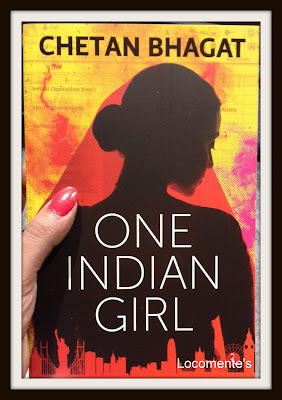 Well, to begin with, author’s obsession with numbers in the titles continues - For a quick recap Five Point someone, One Night at Call Centre, The 3 Mistakes of My Life, 2 States: The Story of my Marriage, Half Girlfriend and now One Indian Girl! The cover page is simple and very relevant to the plot. I loved the dedication; a perfect one rather. The narrative is free-flowing and most of the times dramatic. It has a cinematic quality to it and I am sure it would be a treat to watch this on big screen. In this book, the author ventures into a less discussed area, what a woman wants; rather what One Indian Girl may want! She doesn’t want to be reminded every day that she is a girl and hence she is different. While most of the girls are not lucky enough to get quality education, few ones are blessed to get some. But then, if she turns out to be intelligent and smart, she would end up earning as much as any man of her age (okay, may be more also). She would be an inspiration for young girls in her family, office and almost everywhere. However, elders in the family and friends would see her as loser because she is unmarried!!! Her life becomes irrelevant and her achievements becomes insignificant. If she finds love, he will admire her intelligence and her company. He will appreciate that she is knowledgeable. He will be glad to share drinks and smoke. But, if she asks about commitment or marriage, he would shy away. He would say quit job/drinking/smoking, become more domicile – start cooking, bring up kids, stay at home, be a home maker and all that. Many men would even feel insecure because the girl is earning more or because she is independent. They would be intimidated. One Indian girl explores all these topics in a subtle way. However, the protagonist of One Indian girl fails to connect with the readers at a personal level. At work, we know she is a superstar. But as a person, she comes across uncertain, concerned about her looks and hence slightly under confident. She is more focused on grabbing men’s attention than enjoying her time by being herself. I wish she was shown as travelling the world (which she eventually does), making new friends and so on. While the characterization of Debashish and Neel is impeccable, Radhika comes across as emotionless. When she cries, we don’t cry along. When she is in love, we are not happy. When she is confused, we are not anxious. She fails to connect with the readers. I wish her mother was not so dramatic and more understanding like her father. Also, I so wished that the story unraveled in India. After all, don’t we all have a perception that anything can happen in foreign country, but not in homeland? Read it if u r a girl or if u r man enough to read about a not-so-typical girl!!! Guess what? I got the book on October 1st, 2016 @ 2:30AM. The store person said that I am the first person to get it from that store. Hurray!!!! I am not a Chetan Bhagat fan but somehow end up reading all this books. Can't wait to start this one. Your review I liked.Detailed, yet the important contents hidden proving curiosity to the readers.Nice,Satya. This my story ... Love, cat.